Parsuraman, believed to be great founder of Kerala, consecrated as many temples across the land. In order to perform the customary duties of temples he authorized 12 thanthri’s. One among them is the Tharananallur Thanthri who is the thanthri of Kottarakara temple. He is the thanthri of Sreepadmanabha Swami Temple, Thiruvananathapuram. 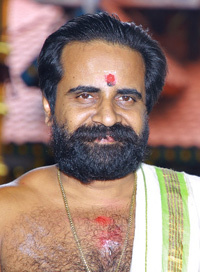 He learned the Pooja & the temple rituals from Chennithala Puthillam Brahmasree Narayanan Namboothiri, a well known Thanthri in Travancore Devaswam Board and he is also the winner of the award, such as the Guruvithetha and Tantric Shiromani. After the schooling, it is the first time that Shanti enters Paravur group in P. D. Chirakkal Mahadevar temple in Thirumoodkuzha sub group in Paravur group in 2007. Until then, along with the Guru, many other temples were dedicated to the tantric rituals such as the Pratishtha, Tiruvulsavam, Astabandakalasham and Dwajaprathista. Learned Pooja & Temple rituals from Puthumana., Ambalappuzha and served as an assistant at Alappuzha Mullakkal Devi Temple and Chettikulangara Devi Temple. In the year 1996 Joined service at Changayil Kavu Devasowm of Karunagapally group. The initial Devaswom posting as a priest was at Nooranadu Pallikkal Kantala swami Temple. After that served as the chief priest of Thevalakkara Devi Temple, Achankovil Dharma Sastha Temple, Aryankavu Dharma Sastha Temple, Anchal Agasthyacodu Mahadevar Temple and Karavaloor Peedika Devi Temple. 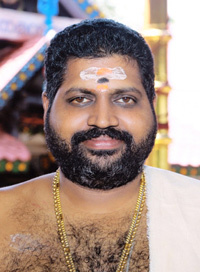 From Karavaloor , his next posting was as the Chief priest of Pampa Ganapathi Temple in the year 2011. Then after serving as the second priest of Chadayamangalam Mahadeva Temple, he was posted as the second priest of Kottarakkara Sree Maha Ganapathi Temple.